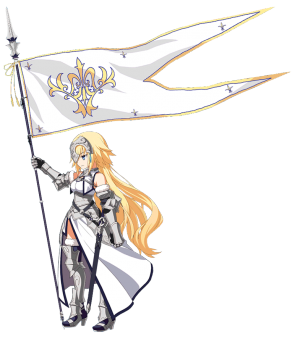 This article is for the 5★ , Jeanne d'Arc. 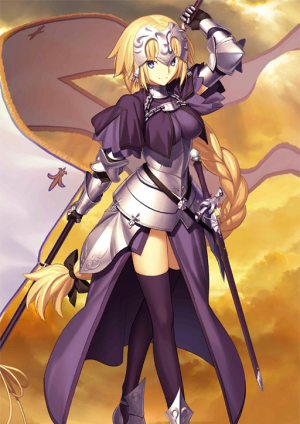 For the 5★ , see Jeanne d'Arc (Alter) or for 5★ , see Jeanne d'Arc (Archer). 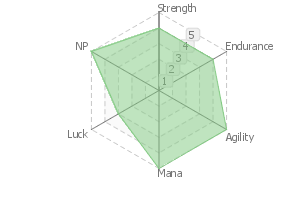 Increase your Debuff Resist by 25%. Remove Debuffs from all allies. 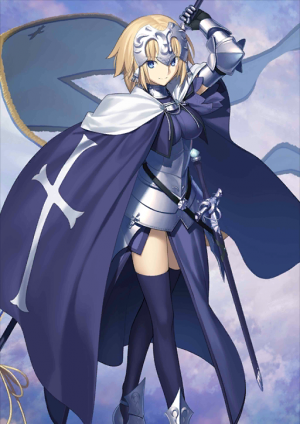 Increase Buster Card performance of all allies by 15% while she's on the field. A special class of Servant called a Ruler. The world's most renowned saint. She left her homeland at age 17, and in the two short years before she was burned to death at age 19, she engraved her name in history. She is the saint who saved France, and after a miraculous rise to power, she was shamed and met a tragic end. 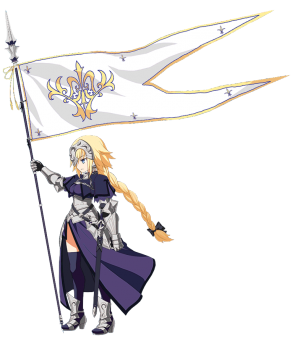 Even after her capture, Jeanne kept performing miracles. A country girl that knew nothing other than the Bible and a small number of prayers, she held her ground in debates with the best theologians with her quick wits and sharp mind. This made her very difficult to execute. One soldier who openly said that he'd be "glad to put a witch like Jeanne d'Arc to flames" witnessed a white dove fly away after she burned. Upon seeing the bird, he realized he had killed a true saint. in the form of a sword. strict and will give her Master an earful from time to time. The world's most renowned saint. She left her homeland at age 17, and in the two short years before she was burned to death at age of 19, she engraved her name in history. 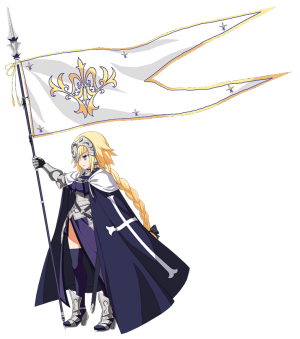 She is the saint who saved France, and after a miraculous rise to power, she was shamed and met a tragic end. 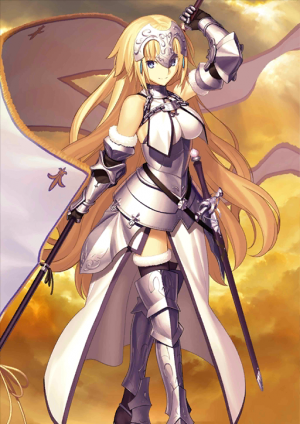 One soldier who openly said that he'd be "glad to put a witch like Jeanne d'Arc to flames" witnessed a white dove fly away after she burned. Upon seeing the bird, he deeply regretted his actions as he realized he had killed a true saint. A conceptual weapon that is triggered with her last words "O Lord, I surrender myself to you..." It's a Reality Marble variant, where her inner world materializes in the form of a sword. 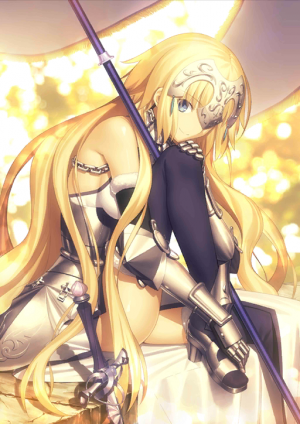 As long as her Master is honorable... no, even if they are dishonorable, Jeanne will never desert them. She will overcome all obstacles with them. 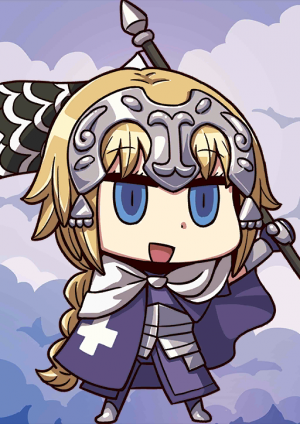 However, she is rather strict and will give her Master an earful from from time to time.